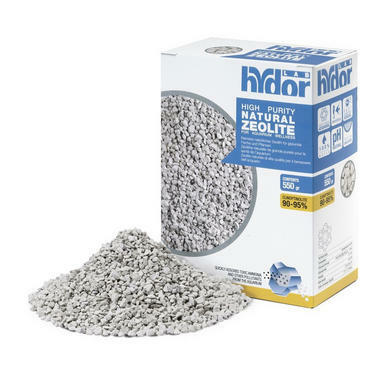 Hydor Zeolite Natrual Aquarium filter media, ideal for use in Salt and Fresh Water aquariums. This natural aquarium media effectively removes the ammonia present in tank water. Ammonia can build up from fish and plant waste in the aquarium, the Zeolite media traps the ammonia through the high ion exchange capacity present in the make up of its natural compound. The Zeolite helps to eliminate dyes, algae and other substances and restores the water to its best.